Product Catalog > Women's Tennis Apparel > Tennis Skirts With Shorts, Capris too! Tennis skirts with attached compression shorts, sport shorties and capris are here. Our complete line of tennis skirts are offered in all sizes, Petite to Plus Size and everything in between every day without exception. Here's a feature you won't find anywhere else, our clients can customize their tennis skirts by adding or subtracting length to any of our skirts for Free! Questions? Please don't hesitate to contact us. We love talking tennis skirts! 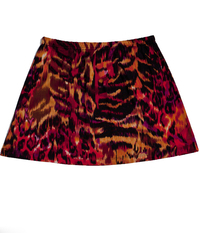 The A Line Tennis Skirt With Shorts in Wildfire - New Low Price!